A hackneyed phrase for a hackneyed destination? So why not explore this Himalayan land off-season, before things change. Reason #1 – Drive through constantly changing landscapes. Reason #2 – Have the popular tourist spots all to yourself. Reason #3 – Experience subzero temperatures. Reason #4 – Meet the Nomads. Reason #5 – Witness changing seasons. The first thing one notices in Ladakh in winter is that here the landscape changes every day, every hour and just driving through this pristine and untouched white Ladakh is in itself a beautiful journey. Right from the glittering ice on the frozen Indus River by the road as the sun comes up to how the sun kissed peaks in the clear distance light up at sunset, every minute you drive through this high altitude desert brings you closer to the beauty there is in this world. Prayer flags flutter in the cool crisp breeze against the stark backdrop of the snow covered mountains touching the flat white sky and there isn’t a soul in sight. This however isn’t just a one off experience when you make that random stop along your road trip. Be it the popular Shanti Stupa, the monasteries in and around Leh or the roads that whisk you off further into the heart of this exotic land, you will find them all relatively deserted, save a few locals. Bundled up in layers and insulated pants, I experienced temperatures of the kind I had only dreamt of till then. As the climate world over steadily changes or worsens, depending on the world view that one subscribes to, Ladakh too has experienced a winter this year that has not had a precedent in these many years past. This meant that we could not visit any of the lakes. 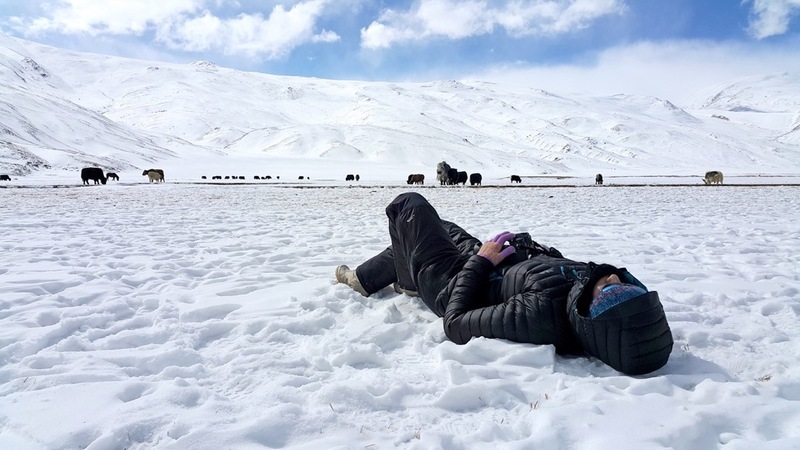 It took five men just to get us out and back on our way as our massive SUVs struggled to trudge through the five feet deep snow on the road to Tso Moriri. Be that as it may, every experience like this in the stillness of the mountains as you watch the flurries of snow swirling down to your feet is a memory to be savoured a lifetime. In Changthang Valley in the Eastern Ladakh Region is Puga. A small nomadic village, where Tibetan Nomads on the Indian side settle down for the four cold winter months and tend to their animals. They come from the village of Hanle, their summer home. Traversing the same migratory routes across Ladakh every year and staying in their semi permanent encampments in Puga. The Changpas are a warm and friendly people and their children spending their school vacations here, will happily take you around, for the novelty of visitors in winter is a welcome distraction. If you have already been to Ladakh during the tourist season between May to September, this is reason enough for you to revisit the land of high passes off season. For, while the charm of Ladakh in summer lies in its vivid blue skies and stark landscapes, winter Ladakh’s lies in the powdered sugar patterns of snow on the same barren and rocky landscape. Winter Ladakh’s biggest draw though, remains the Chadar Trek. As winter sets in and temperatures drop, the north flowing tributary of the Indus River, the Zanskar freezes over. What in summer is a mighty, indomitable swirl is tamed by a ‘blanket of ice’, the chadar that forms on it. This sheet of ice that is on an average six feet deep, is crossed by hundreds of trekkers every year to see the now celebrated frozen waterfall at Naerak. As human pressure on this phenomenon of nature increases, the possibility of a trek on the Zanskar itself disappears. Rapidly. Getting There: There are regular flights flying from Delhi to Leh. Shop: The Tibetan Refugee Market on the road leading from the popular hotels to the Leh Market. It is a good place to stock up on all the winter essentials that one might have missed out on packing. For while most shops remain shut during the winter months, this market is open through out the year and one can find everything from monkey caps and gloves to neck gaiters and winter boots. The images! Soaked in beauty! !